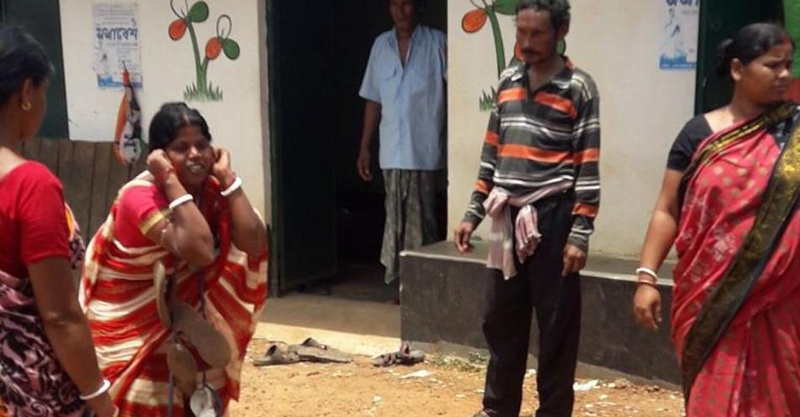 A woman in West Bengal West Midnapore district was assaulted and forced to walk around the village wearing a garland of shoes by Trinamool activists for purportedly protesting against the party during the May 14 panchayat elections. Even as district party leaders promised to take action against those found guilty, the local workers who had committed the act remained unrepentant and threatened to “punish” those who acted against the party. The woman, in her thirties, is the wife of a former Trinamool Congress member of the Kankabati gram panchayat. She had protested against booth capturing in her Bagdubi village by Trinamool activists on the polling day and had asked them to fight elections democratically. However, she said “it made them think that I was supporting the independent candidate”. The independent candidate, Sikha Paria went on to win a seat in the panchayat, which also saw Trinamool getting 11 seats and BJP 4. Angry Trinamool activists allegedly called her to the party office in the village and “punished” her by abusing her and making her wear a garland of shoes and walk around the village. They also assaulted her and forced her to do sit-ups holding her ears, she told media persons. It is also alleged that Asish Patra, the booth president of the area, was present at the spot while she was humiliated. However, he claimed that no such incident had happened. But the others, who were there then, were unrepentant. “She had insulted the party leaders and we will not spare if any one dares to do such,” said a Trinamool activist. The woman has not yet filed a complaint with the police out of fear. District BJP president Samit Das has offered support in taking legal action against the accused. Villagers who were disgusted by the act did not dare to protest out of fear. The incident happened on Friday afternoon and came to light on Saturday, triggering a wave of criticisms against Trinamool on social media. “After being informed about the incident, I have asked the local leadership to give me a detailed report. We are looking into the matter and we will not spare the offenders,” said Ajit Maity, president of West Midnapore district Trinamool Congress committee. The woman said her actions were mistaken and “hence I was ridiculed in such a manner”. Her husband said they were supporters of Trinamool Congress, but were “apprehensive of continuing with the party” after this incident. BJP and Congress said the Trinamool activists had crossed all limits. “During nomination, the state had seen that the women were not spared by the Trinamool Congress activists and in many places the women were beaten up. But what had happened at Bagdudi had crossed all limits. The administration should take strong steps against those who had humiliated her,” Arup Das, a BJP leader in Midnapore said. “It is a matter of great shame. Trinamool Congress did not even think before insulting a woman in such a way,” said Anil Sikaria, a district Congress leader.